British Library, Harry M Weinrebe Learning Centre, 96 Euston Road, London NW1 2DB, Wed 5 Dec 2018, 3:30pm – 5 :30pm. Places limited: book here. Taking Swiss literature as its starting point – a country itself with multiple languages – this workshop introduces the multitude of considerations that emerge when translating literature and suggests tools to help translators reach publishers and other publishing media contacts. The workshop begins by considering various themes in translation (including meaning and intention, humour, the right language in the right hands, love and letting go, breath and music). Figures from both the publishing and media worlds then address the challenges facing translated literature and translators now, and how best to reach the reading and reviewing public. 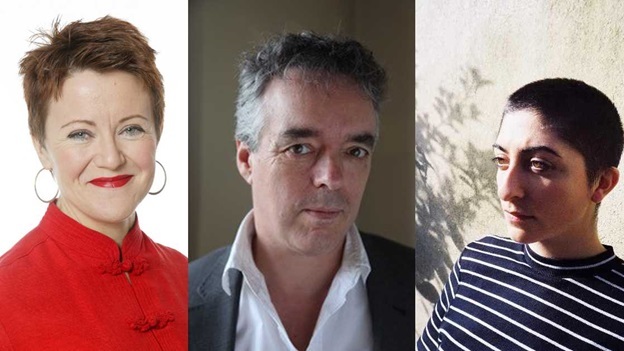 Featuring Rosie Goldsmith, founder of the European Literature Network, translators Jen Calleja and Shaun Whiteside, and representatives from the worlds of publishing and literary journalism, including Toby Lichtig from the Times Literary Supplement. No knowledge of any Swiss language is required to take part. Jen Calleja is a writer and literary translator from German. She has translated works by Wim Wenders, Gregor Hens, Kerstin Hensel, Michelle Steinbeck and Marion Poschmann. She writes a column on literary translation for the Brixton Review of Books and she was the inaugural Translator-in-Residence at the British Library 2017-2018. Shaun Whiteside’s latest translations from French, German and Italian. include Black Water Lilies and Time is a Killer by Michel Bussi, The Temptation to be Happy by Lorenzo Marone, Malacqua by Nicola Pugliese, Blitzed by Norman Ohler and To Die in Spring by Ralf Rothmann. He has previously translated works by Nietzsche, Freud, Schnitzler and Musil for Penguin Classics. Rosie Goldsmith is a champion of international literature, translation and language learning. A linguist herself (French, German, Italian), she has lived in Europe, Africa and the USA. She was an award-winning journalist at the BBC where she travelled the world and presented several flagship programmes such as Crossing Continents and Front Row. She is Founder and Director of the European Literature Network, Chair of Judges for the EBRD International Literature Prize and presents the literary podcast called The Words. She’s been a member of Pro Helvetia’s Editorial Team for 12 Swiss Books since 2013. Toby Lichtig is the Fiction and Politics Editor of the Times Literary Supplement. His freelance reviews and journalism have appeared in publications including the Wall Street Journal, the Telegraph, the New Statesman and the New Humanist. He is a regular guest on BBC Front Row.Supported by Pro Helvetia, the Swiss Arts Council.